Teardrop flags are one of the most versatile ways to advertise your business. 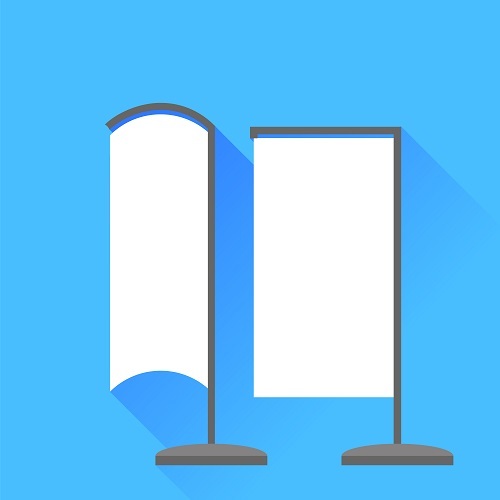 Also called teardrop banners, teardrop flags are a great way to promote a business of any size. We have supplied such flags to many Perth businesses over the years with great results. Teardrop flags are shaped like an inverted teardrop coming out of the ground. They can be attached to a standard 4-leg cross base, a heavy cross base, a car tyre base, a wall base or a floor base. They are available in three basic sizes. A small is 2.5m, a medium is 3.5m and a large is 4.5m. They also come in six different shapes: the standard teardrop shape and five different wing shapes. What Makes Teardrop Flags so Popular? Teardrop flags attract attention. Because they don’t require a lot of space, they can be placed strategically in places that are guaranteed to attract passers-by. They attract people visually with bright colours and clever designs. They also attract people because they flap in the wind, making passers-by turn their heads to find out what is making the noise. Teardrop flags are also attractive because we can put any design you want on them due to a process called sublimation. Sublimation dyes are absorbed directly into the fabric. Our computer-generated process allows us total freedom of design. We can create photo-quality designs, using photographs or artwork. We can also put your company name and logo on teardrop flags. They are large enough to hold all of this and any message you want to convey to the public. Teardrop flags can be used for trade shows and any outdoor event. They can be used as open house signs and moved from event to event. They are also being used at a lot of sporting events, for directions and advertising. They are also used at entertainment venues for concerts, plays and other events. To learn more, call ImagePak Marketing today: (08) 92444 111.